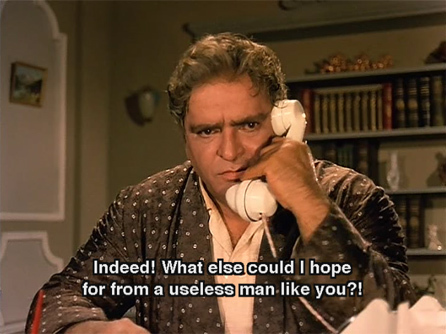 Srivastava (Prithviraj Kapoor) is a wealthy man with two sons. The eldest, Mahendra (Rehman) works with his father while the younger Sunder (Shammi Kapoor) is studying in college. Srivastava is very hard on Mahendra, who is quiet although hard-working, even shouting at him in front of colleagues. This naturally makes Mahendra somewhat reticent and timid with his father. In contrast to his treatment of Mahendra, Srivistava dotes on Sunder and praises him to the skies. Of course (being Shammi) Sunder is a happy-go-lucky kind of fellow; he doesn’t work hard at all except at tennis and having a good time. 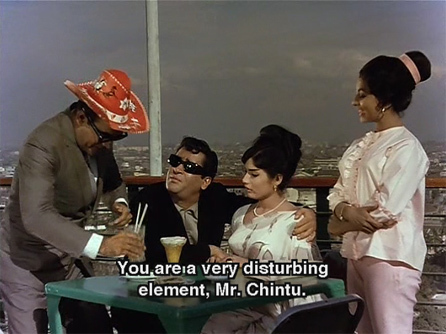 His best friend is Chintu (Rajendranath), whose father is not wealthy. Sunder is also close to Mahendra, and understands what his father is like. Mahendra is in love with Seema (Shyama), who works in his office, and has promised to marry her. Srivastava is planning to marry him off to the daughter of a rich man, but Mahendra lacks the courage to tell him about Seema and keeps putting it off. Meanwhile, Sunder and Chintu are off to Kashmir for a tennis tournament that Sunder is playing in. Sunder convinced Chintu’s miserly father to pony up for Chintu’s train ticket by disguising himself and pretending that he had won a crossword puzzle competition. I think I missed some cultural “humor” in this one! Sunder gets off the train to fill a thermos with water; the train starts to move before he gets back on it, and he ends up in the wrong compartment. Most of the girls in it are happy to forgive him when he pleads for it—wouldn’t you? but not Sapna (Rajshree). She makes him stand with his hands up until the train pulls into the next station where he can get off and find the right compartment. 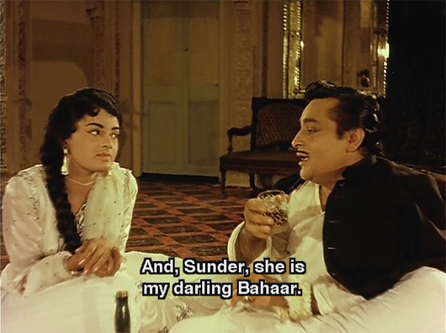 At the hotel in Shimla, though, the tables are turned when Sapna goes accidentally into Sunder’s room (a room number 9 turns into a 6 in true filmi fashion). He pays her back in kind by humiliating her in front of her friends. They are not off to a good start! But maybe another disguise will do the trick? Maybe not. But his persistence does pay off eventually, as always! 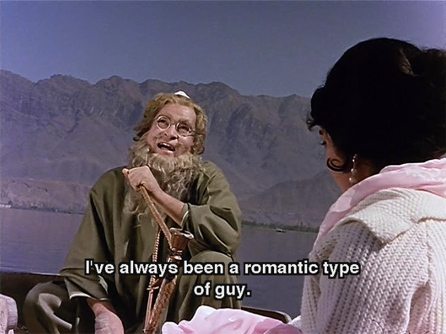 I could not say it better myself, Shammi my love! She caves, but has reservations. She is an orphan and very poor and doesn’t feel worthy. He doesn’t care, though, and reassures her in a very sweet scene (*sigh*). Meanwhile, Mahendra has gone to Calcutta to do some work for his father. His father continues to abuse him by phone, and Mahendra finally snaps. He starts drinking and carousing in order to relieve the pressure. Sunder returns home with his championship trophy. He tells his mother (Achala Sachdev) about Sapna. She says she’ll try to help convince Srivistava to accept her but doesn’t seem very hopeful. Sapna has reached home too—incidentally, her foster father is an accountant for Srivistava—but her foster mother (Manorama) is a nasty piece of work. Only Chintu gets a happy reception. His father actually did win the prize of 50,000 Rs, and he approves of Chintu’s marriage to Sapna’s friend Radha (Madhavi?). At Chintu and Radha’s wedding reception, we are entertained by our old friends from Gumnaam: Ted Lyons & His Cubs! 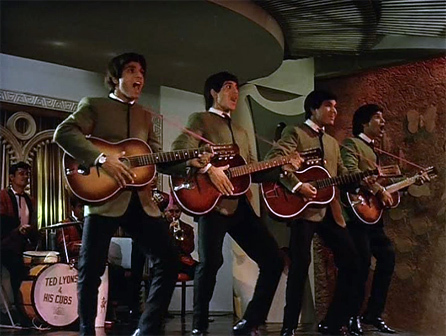 Shammi (in a Beatles wig) and Sapna sing “Tumse Hai Dil Ko Pyar”—the tune lifted from the Beatles’ “I Wanna Hold Your Hand”—and a rocking good time is had by all. But the good times—naturally!—are coming to an end. In Mahendra’s absence, his father has fixed his marriage with Miss Sinha as promised. While the Sinhas are visiting, Seema comes to see Srivistava. She tells him that she has tried to contact Mahendra but has not heard back from him. She is desperate. Srivistava furiously accuses her of using his son to cover up for her promiscuity, and tries to buy her off with 20,000 Rs. As she leaves in tears, the servant Bansi tells Sunder of her visit. Sunder runs after Seema, afraid that she’ll do something rash. He says he’ll take her to Calcutta on the next train. At the station, Chintu and Radha are being seen off on their honeymoon by their friends, including Sapna. They see Sunder and Seema running for the Calcutta train and boarding it. Sapna is bewildered and hurt. Sunder’s mother then tells Srivistava that Sunder is in love with Sapna—when he finds out who she is, he goes into another rage. He tells her foster father that he’ll be fired if he doesn’t get Sapna married elsewhere within ten days (Srivistava knows that Sunder has gone to Calcutta, although not why). In Calcutta, Sunder and Seema are having trouble finding Mahendra. When they do finally, he is a drunkard, and in love with a courtesan (Rani). What a tangled web! Can Sunder help Seema? Will Sapna be married off to someone else? Will Srivastava ever get knocked off his high horse? Believe me, you want him to! and the magnificence that is Shammi. Posted on May 2, 2008 at 5:53 pm in Hindi movies, Yahoo! Shammi! | RSS feed You can skip to the end and leave a reply. Yup, that’s the one! 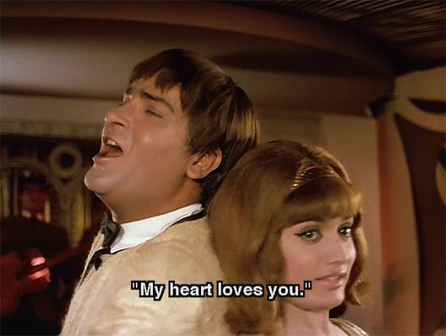 It’s a great song, Shammi goes all out to annoy Rajshree in it. I know I do say it all the time, but it IS one of my favorites. 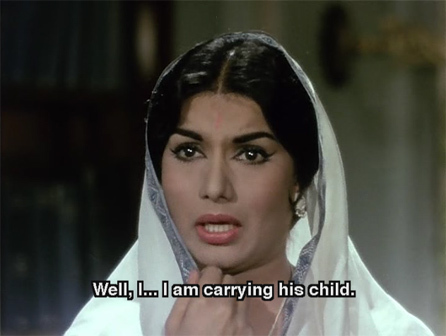 Rajshree was so pretty- not a good actor, but so adorable, esp in Indian outfits. And the Beatles’ aped song is so great- I dunno which version is better honestly, though I am sure plagiarism is a bad thing :) And Rehman may be a bad man, but my inexplicable love for him holds true…lovely post memsaab! My husband has been pushing me to watch this one…we watched the songs last night, and we’ll probably watch them again tonight. 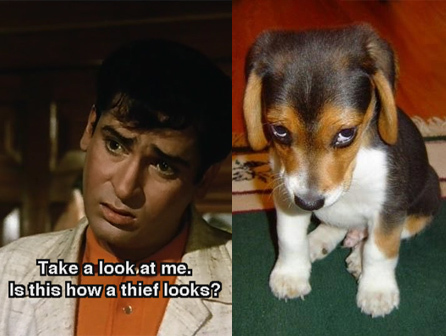 Shammi has the dreamiest eyes, puppy-dogging or not! Aimee, you will be happy to watch it :-) Over and over again!!! It’s the Beatles song movie! Hurrah! Looks fun – love the fab clothes. 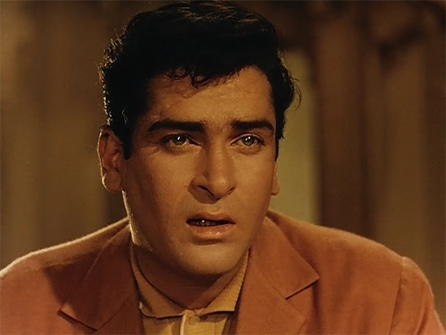 Shammi Kapoor starred in some of the finest films betwee 1960 & 1070 and Janwar was one of them. 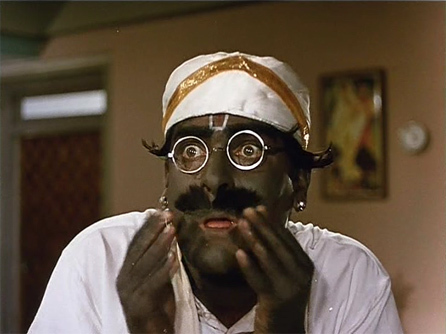 If anyone who added more spice to his film it was Rajendranath, whose buffoonery was a trademark of his unique comedy. 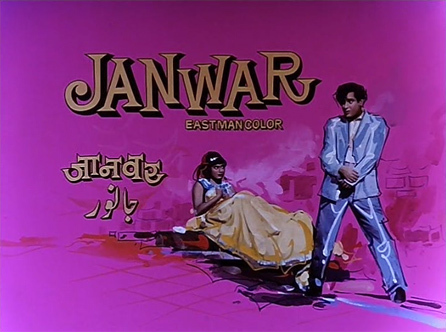 Janwar was his ultimate jugalbandi with Shammi and a lot of the entertainment factor of Janwar should be credited to Rajendranath. 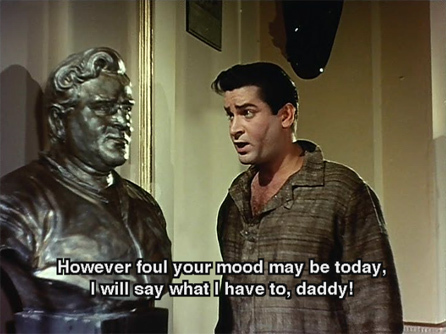 And on this I am sure even Shammi Kapoor will not agree less. I agree completely too. 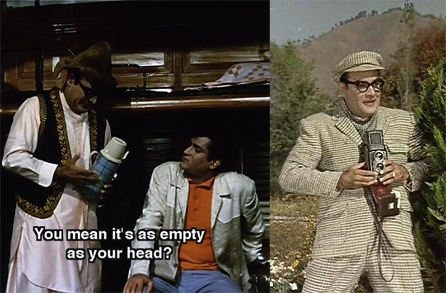 I love Rajendranath—he makes me laugh helplessly, I only have to look at him sometimes to start. And I think he always was at his best with Shammi, they were great together. BTW, what is jugalbandi? That is a word I want to use!!!! 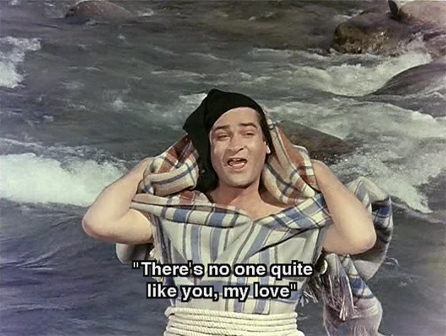 :) I think my favorite Rajendranath-Shammi film is Rajkumar. They are HILARIOUS in that together. The term is mostly used in musical concert where two artists perform together, like say the jugalbandi of a vocalist with an instumentalist. Just watched this film this afternoon. Such bliss! 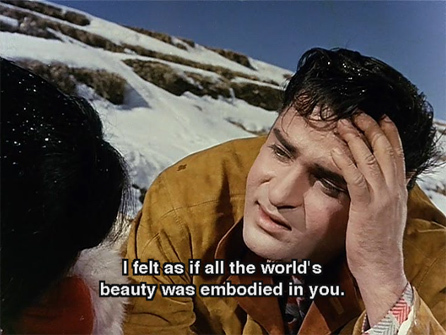 I love films of Shammi where he romances in lovely Kashmir and later the film ends in drama at Bombay or wherever he lives in a city, and this film was just that!! The songs are wonderful. Isn’t it true that Rajshree fell in love with an American man, got married, and moved to LA in late 60s, leaving a few movies, notably Suhaag Raat with Jeetendra, incomplete?